Operating since early 2017, Arcanebet is an online betting site with a major focus on esports, offering real money wagers on an impressive selection of games including DOTA2, Counter Strike: GO, League of Legends, World of Tanks and several others. The site accepts accounts from most countries and supports multiple languages, including English, Spanish, Russian, Dutch and Chinese, making it suitable for a wide global audience. 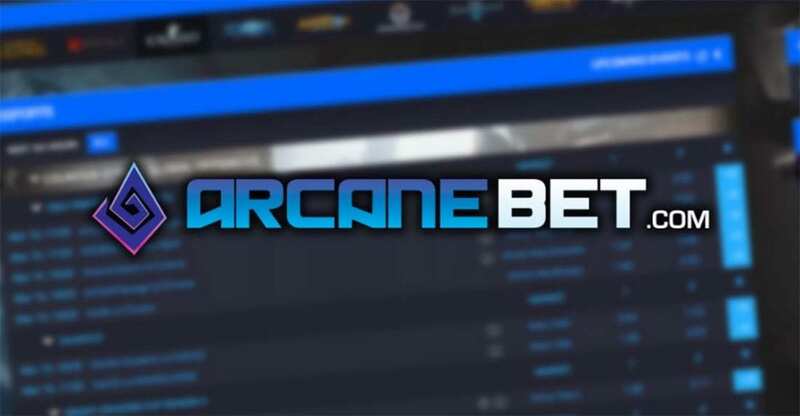 We’ve taken some time to thoroughly test Arcanebet to bring our readers a detailed review on what the site has to offer, including its strengths and weaknesses and what to look out for when placing real cash bets here. Licensed and regulated by the Government of Curacao under Curacao eGaming license number #365/JAZ, Arcanebet restricts residents from the following countries from registering for a betting account: USA, United Kingdom (Great Britain & Northern Ireland), Spain, Bulgaria, and Hong Kong. Arcanebet’s terms and conditions also stipulate the site will not provide services to any region where online gambling is illegal, so it is up to you to know whether you are permitted to place real money bets online from your country of residence. New players who sign up for an account at Arcanebet via EsportBet.com can claim an exclusive bonus offer in addition to the regular sign-up bonus, which includes up to €100 in bonus money when depositing real cash for the first time. Arcanebet and EsportBet.com’s bonus offer: Claim a 100% deposit bonus up to 100 EUR with no minimum odds by using the promo code, ‘esportbet’ in the deposits section of your Arcanebet account user panel. Please note that this bonus carriers a 12x bonus rollover wagering requirement before you can withdraw any winnings. Read our more detailed guide on how to claim the Arcanebet.com/Esportbet.com deposit bonus code here. Arcanenet regular sign up bonus offer: Claim up to €100 in bonus money on your first deposit upon registration. To take advantage of this offer, you need to deposit at least €10 and enter promo code ‘100ARCANE’ – Arcanebet will then match the amount of your deposit by 100% up to €100. The bonus offer is subject to a 5X rollover requirement, which must be met within 180 days of making the deposit otherwise the bonus money will expire. Also, it’s important to note that deposits made using Bitcoin at Arcanebet are not eligible for these bonus offers. What esports events can I bet on at Arcanebet? There’s also occasional events for Warcraft, King of Glory and more. Just head to the Arcanebet homepage for a full list of the upcoming esports betting markets. What other sports can I bet on at Arcanebet? If you’re looking for a larger selection of sports to bet on along with your eSports wagers, try one of the other betting sites we recommend, like William Hill or BetEasy, which offer a comprehensive selection of sports betting and novelty betting markets along with their eSports offerings. The payment methods you can use at Arcanebet will depend which country you are playing from, with different options available to players from different regions. To see which deposit methods are available to you, sign into your Arcanebet account and go to the cashier section for a full list of your choices. Alternatively, you can request a list from the customer support team via email. Note that players are only allowed to withdraw a limit of €100,000 or currency equivalent per 30 days. If the amount requested to be withdrawn is greater than €100,000, the remaining amount will be placed back to the player’s account to be withdrawn the following month. There is also a ‘Help Desk’ section available which we assume has answers to commonly asked questions and other helpful information, but we have been unable to access this section of the website due to security issues. This error is likely a temporary SSL (secure socket layer) issue, but it does not fill us with confidence and we were disappointed not to be able to access this information when we needed it. There are also strict terms in place at ArcaneBet regarding verification of your identity, including a rare stipulation stating that Arcanebet may request a video call confirmation to verify your identity using Skype, Discord, WhatsApp video call, FaceTime. Members may also be required to provide Arcanebet with copies of government-issued identification documents, utility bills or proof of financial source ownership. Arcanebet.com is not a particularly attractive or user-friendly betting site and we were disappointed by its lack of exotic betting markets and live chat, but this site still holds some good value. The large selection of esports betting events is impressive and we like the new player sign-up bonus which only holds a 5X wagering requirement (although Bitcoin users beware, this bonus does not apply to you). All up, Arcanbet provides a good, safe and legally licensed platform to place real money bets on a range of global esports betting events in a regulated environment.